I love it here. I especially loved the off-season, when it was quiet and sleepy and there were no tourists around. The roads were less busy, everyone was more relaxed, the markets were less frantic. Once summer really arrived, though, we noticed a big change – bumper to bumper campervans on the roads, everyone is a bit hassled and the markets are just insane. We had already noticed that if we ate or drank in popular touristy areas, like Cassis or Gordes or Nice, it was invariably more expensive, but we were still smugly priding ourselves on having chosen to live in the cheap end of the Luberon. Then, suddenly, we were charged €2.70 for a beer at our local, Le Café du Cours. €2.70? we asked. We paid €2.50 last week! Oh, explained the waitress. In the summer there’s a 20 cent surcharge for drinking on the terrace. Ohhh..ka-a-a-y… fair enough. The terrace is across the road from the café and the staff are whizzing back and forth all day, laden with trays of drinks, dodging the traffic as they go. They deserve danger money, if not a contribution towards shoe wear & tear. We’ll accept a Drinking-on-the-Terrace Tax. Then there was Brazil Day in Le Petit Village. The LSH arrived at our table with three shots of rum, one each for me, Sara and Mrs London. “That was fifteen euro,” he whispered to me. A bit steep, we agreed. Then I sent him off for 7Up to attempt to sweeten and dilute the rum. “€2.50,” he announced when he came back. €2.50??? For a plastic tumbler full of 7Up? A can costs 50 cents in the supermarket! A while later, Sara needed more 7Up and headed off to the bar. She was charged €2.70 for the same plastic tumbler but she noticed that it wasn’t even 7Up – it came out of a big bottle of generic supermarket white lemonade. €2.50 per tumbler was one hell of a mark-up on a €1.00 bottle of fizz, but why was I charged €2.70 when Martine’s LSH was charged €2.50, she wondered. Do I look scruffy? Is this a Dirt Tax? Or did the barmaid fancy the LSH – did he get TaxBack? Or do they have a surcharge for women customers – a Woman Tax? Maybe because of Eve and the apple and the Garden of Eden and all that – that would make it a Sin Tax. 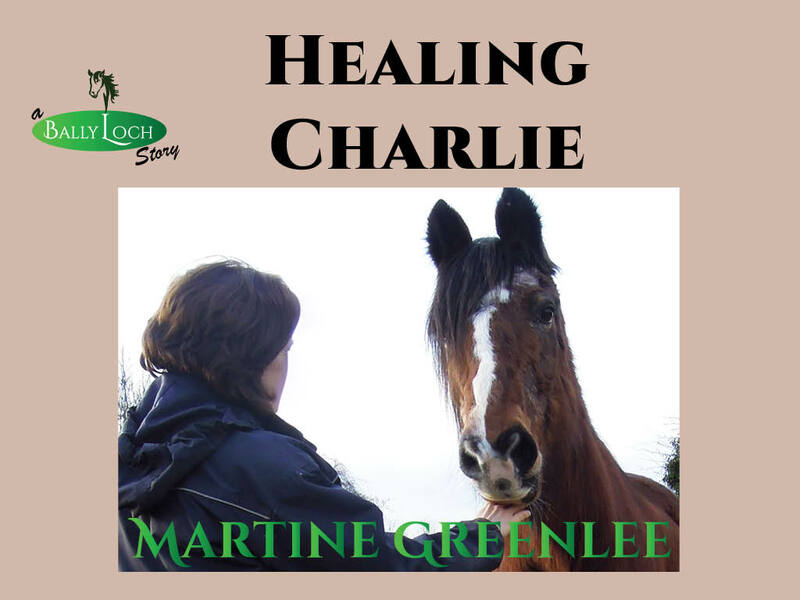 Her husband Gregory was dispatched to the bar to find out. A Tourist Tax! But of course! Silly us – we never thought of that one… I don’t think anyone even thought of that one back in the good old days of Rip-Off Ireland. Then it was time for lunch. Remember this from my last post? Two sausages and a small plate of chips. It was ten euro! TEN! 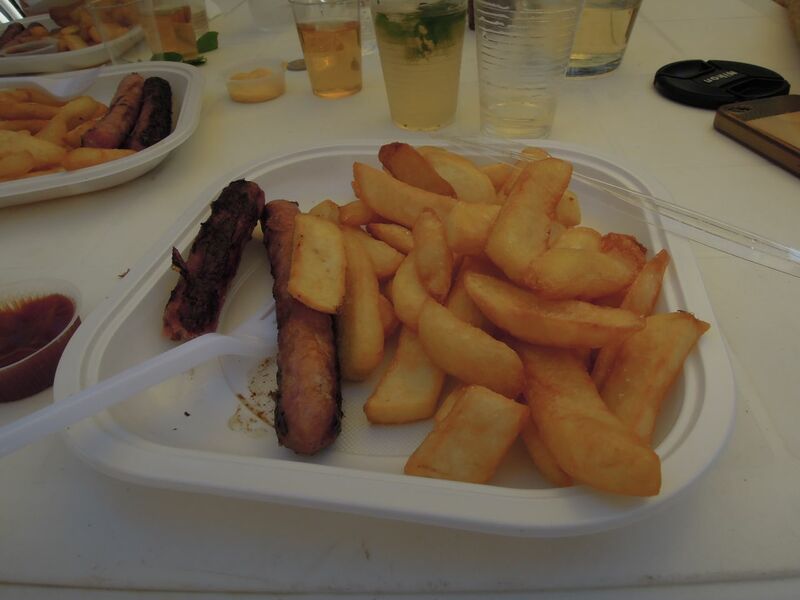 For two chipolatas (small sausages) and thirty chips (I counted them). TEN! I’m still recovering from the shock of it. We spent some time speculating as to the breakdown of the meal. Maybe it was one euro per sausage, which would make the chips come out at a little over 26 cents each. Or maybe it was two euro per sausage, which would make it just twenty cents per chip. Whichever it was, I made damn sure I didn’t leave anything behind. The little tubs of mayonnaise and ketchup were great value though. They were free. Or maybe they felt they had ripped off their customers enough already, charging them the Captive Audience Tax. 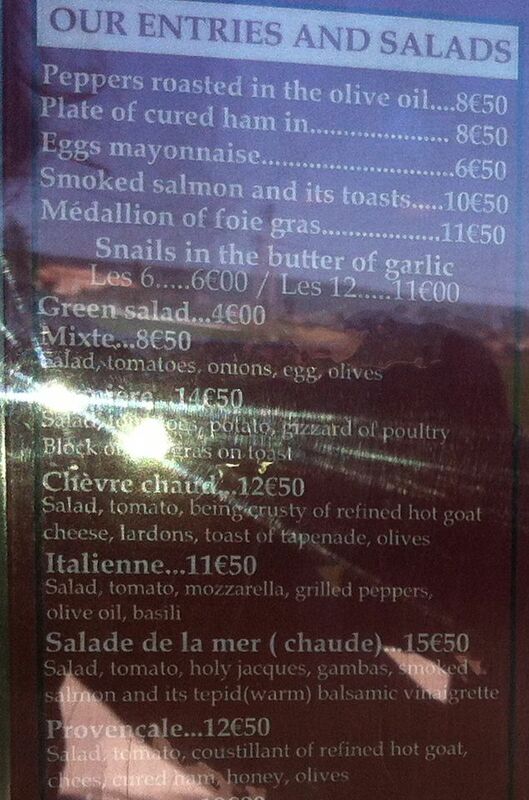 with the seafood salad coming in at a whopping €3.00 extra if you want to eat it in English. They seem to have invented a Random Translation Tax. Needless to say, we always eat the French food, not the English food. We’ve become accustomed to Provence prices. The LSH was in Ireland last week for his mother’s birthday and was shocked to see a main course (an 8oz steak) for €27 – more than twice what we paid for a three course meal with wine and coffee two weeks ago! 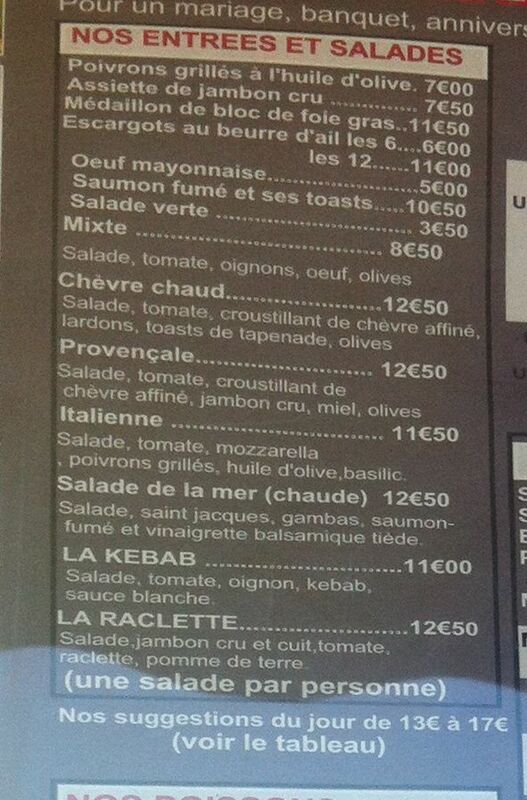 The fact is, you can eat very well and very cheaply in Provence, but shop around and read the small print. In French if at all possible. A cup of cream of asparagus soup today – that’s a CUP- 13.50E in Colmar. Too funny! A tourist tax for those non-French speakers. A little gouge aimed at the hassle of dealing with tourists. The same thing happens here in coastal Maine every summer at the grocery stores! I wish the fair state of Maine would do the same property tax-wise to the 2nd home out of staters, ie. the Bush family et al. Might make the burden easier on the rest of us! I’m so happy you posted this and included that menu, I was dying to see it! It’s all about what’s in demand…everywhere. Fortunately the crowds, campers and chaos will soon be behind us as the “rentree” gets underway. I had not realized the prices were so grossly inflated to take advantage of the tourist boom. I will miss summer, but peace and quiet will be welcome. Traveler beware! I think it’s really awful that they take advantage of the tourists. Well they certainly didn’t spend the proceeds of the Random Translation Tax on a decent translator, did they? No, but I’d love to meet the refined hot goat they refer to. A particularly handsome goat wearing a maroon smoking jacket, sitting in a leather chair smoking a cigar and sipping brandy, perhaps? No wonder I never travel. Well we haven’t stumbled over any wasp nests here!!! It seems much safer than where you live! Interesting. . .how do they keep it all straight?? Here they started this strange thing with the gas and it seems to be only in my area (although we are quite populated). They charge 10 cents more per gallon to fill up at the pump with your credit card. If you go inside and pay cash, it is cheaper. Everyone is always trying to make a buck. That’s like the airlines charging an extra €5 when you book with a credit card!